On September 26, 2016 Apple have published their first ever support article on malware. It’s a notable event because for quite a while Macs have been considered immune to malicious code and Mac OS — impenetrable to man-made hazards. However, either people behind malware have become more inventive or macOS Mojave is more susceptible to external dangers than previous systems, malware is now a Mac problem, too. Plus, an unexpected problem has recently surfaced for the owners of 13- and 15-inch MacBooks Pro with macOS Sierra installed. System Integrity Protection (which is a built-in shield against malware) is for some reason off by default on a number of machines. Cases like that only add up to the general virus-related anxiety in the Mac community. On the flip side, since the arrival of macOS High Sierra in late 2017 we got the new file system (APFS) that Apple promises to be ultra-secure. Here at MacPaw we’ve worked with Mac OS for 10 years and have collected a ton of info on how to keep it safe from harm. In this article we’ll go over possible dangers, ways of protection, and what to do if your Mac is already infected by malware. The first thing Apple suggests doing is turn on your security settings to the maximum, allowing only apps from the Mac App Store or identified developers to be installed on your Mac. This is all good, but the reasons why developers refuse to sell on the App Store are numerous, so there’s a big change an app you need will not be there. It can also be created by developers who don’t have an agreement with Apple and it doesn’t make the app any less valuable or necessary. So what do you do? Avoid software that scares you in its advertisement: your Mac is not under a threat, your system has no critical errors, no, you don’t need ThisApp to save your data. If you have accidentally installed one of such apps and it claims you have something terrible happening on your Mac (ironically, malware usually poses as anti-virus software), the only rule is: never give them your credit card details. The apps that ask for money in exchange for imaginary threat protection or for giving you back control over your Mac are called ransomware. Be on the lookout on websites that distribute illegal (pirated) content. They frequently show huge misleading buttons that install random downloaders or packages and tiny buttons that link to the content need. Google the app developer. Do they have a website? Do they disclose their team, contacts, address? Make sure you’re downloading/purchasing the app from the official website and nothing extra gets installed with it. Avoid unnecessary browser extensions, clean cache and cookies regularly. We could advise you to get a Mac antivirus program or other Mac security software. But the issue with antivirus Mac software is that since the problem is fairly new, few applications deal with it appropriately. Most Mac virus protection apps do little to actually protect your Mac. It’s better safe than sorry in this case, but what if you already have a trouble? What if you already installed a harmful program? Fear not, most of the troubles can be solved quite easily. There are a few ways to remove harmful applications from your Mac and keep all your data intact. For instance, you can use a utility like CleanMyMac X. It will perform the in-depth checkup of your Mac for all kinds of vulnerabilities. CleanMyMac can detect and neutralize thousands of malware threats, including adware, spyware, worms, trojans, miners, and ransomware. Another frequent issue that Mac users have to face is false advertisement of the antivirus programs. It usually goes like this: a piece of software poses as an Mac antivirus or protective program. It claims to defend your Mac against mysterious threats and keep it from harm. As a matter of fact, these apps are usually called something like Mac-“Defender”, “Keeper”, “Security”, “Doctor”, and “Warrior”. Users install a program they believe will fix their problems, but it turned out to be another scam that arrests their system and demands money. If you have faced a problem of that sort, you can use CleanMyMac’s Unistaller module to get rid of the application. Usually, it’s enough to run a “Complete Uninstall” to remove the scam app and all of its components and revive your system back to normal. With the same tool you can Reset your apps to the default state if they are misbehaving or conflicting with one another. 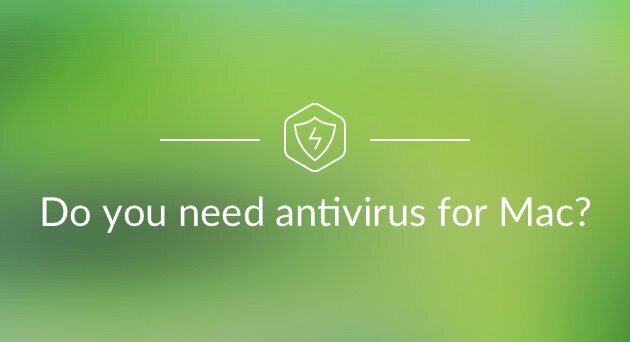 Verdict on virus protection on Mac: do you need an actual antivirus for macOS? Mac OS used to feel like a Great Wall of China for a while, yet now each Mac user has to exercise caution. However, Mac malware in the true meaning of the term is still rare. There are only a few programs created specifically to damage your system. Most of what’s called malware is actually ransomware, adware, and the likes. Something that aims at your credit cards rather than your hard drive. To sum it up, you don’t need specifically designed antivirus Mac software. And, most of it is not antivirus in the first place: it’s either pointless or harmful. That’s why the best protection you can get would be buying apps from trusted developers and making sure you never click on anything that claims your Mac is at risk. For instance, the latest scam I’ve met looked like Google Chrome updates. The only thing stopping me from installing it was the vague memory that Chrome never asks you to install an update, and that it had a weird link in the popup text. So yeah, to be on the safe side, make sure you know what you’re installing.